A significant number of reviews focused on the exceptional comfort of the Adidas ZG Prime. Many runners consider the Pure Boost ZG Prime as worth the investment because of its versatile usability on the road, in the gym, and for casual wear with jeans. The sock-like and supportive fit of the Primeknit upper moves very well with the foot and wraps it in security. The full-contact outsole improves the durability of the EVA material in the outsole. The Boost midsole’s responsiveness keeps the run more dynamic. Some runners wanted more leeway in the compression-like fit of the upper. Other reviewers would have preferred more ground feedback coming from the substantial outsole. Adidas mixes the best benefits of the Boost midsole with the snug fit of the upper for an energizing and form-fitting ride. The road running shoe has decent arch support for speed training or during race days. With the Zero Gravity concept, runners will experience a cloudlike feel when piling on the miles. In a vast market filled with different types of shoes dedicated to running, the Adidas Pure Boost ZG Prime is a breakthrough innovation. If you don’t have a pair of shoes with Boost technology then the adidas Pure Boost ZG Prime will make the perfect addition to your rotation. From the shoe's original version, the Pure Boost ZG, Adidas unveils yet another line in the Pure Boost collection of shoes in the ZG Prime. Featuring the innovative Primeknit upper with the fantastic responsiveness of the Boost midsole, runners can glide past their running goals with a glove-like fit. The ZG Prime takes its cue from the large portion of the upper that is made up of the Primeknit. This is Adidas’ unique upper construction in producing a synthetic yarn that delivers a compression-like fit with decent stretch for an adaptable fit. To deliver that Zero Gravity or floating experience, Adidas places a large piece of EVA material on outsole just beneath the full-Boost midsole. The EVA forms another part of cushioning that gives the running shoe a plush platform without taking away the dynamic returns of the Boost. A molded heel cup with enough pliability holds the foot in place, especially when running on a substantial piece of the Boost midsole and the plump outsole. The fit in the heel to the forefoot is average. There is enough room in the entire shoe for runners to be comfortable in. Adidas makes use of the Primeknit upper to give that snug fit all throughout. Most runners will appreciate the locked in feel from the back to the rear without being constrictive. Available sizes are D for the men’s and B for the women’s. The outsole of the Adidas ZG Prime is eerily similar to the StretchWeb technology that Adidas often uses in its lightweight trainers. For the ZG Prime, the EVA outsole is full-contact and is made of elastic, but durable rubber to fight off wear and tear. The outsole material helps with the plush cushioning in this shoe. 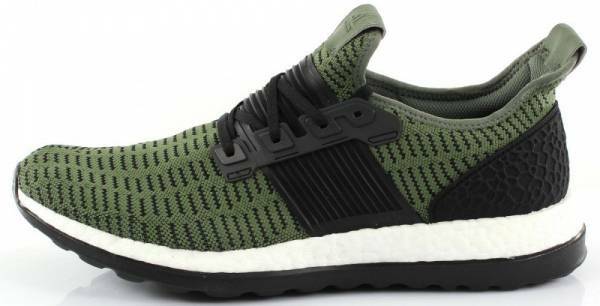 Same as that in the Adidas Pure Boost, a full-length Boost midsole occupies this shoe's main room. This midsole is made of TPU capsules called energy pellets that lock themselves together for impact absorption. After landing, the blown capsules bounce back for superb energy return. Additionally, these energy bullets do not compromise its responsive cushioning in any kind of weather. The Adidas Primeknit material is engineered to naturally adapt to the runner’s foot. It means that runners will get support and flexibility in all the right areas. The inclusion of the Dynamic Fit provides that sock-like feel that hugs the foot. Adidas ensures a cool run with the kind of breathability that the shoe offers. The molded heel cap and the molded eyestay are all designed to work with the runner’s foot without compromising support.